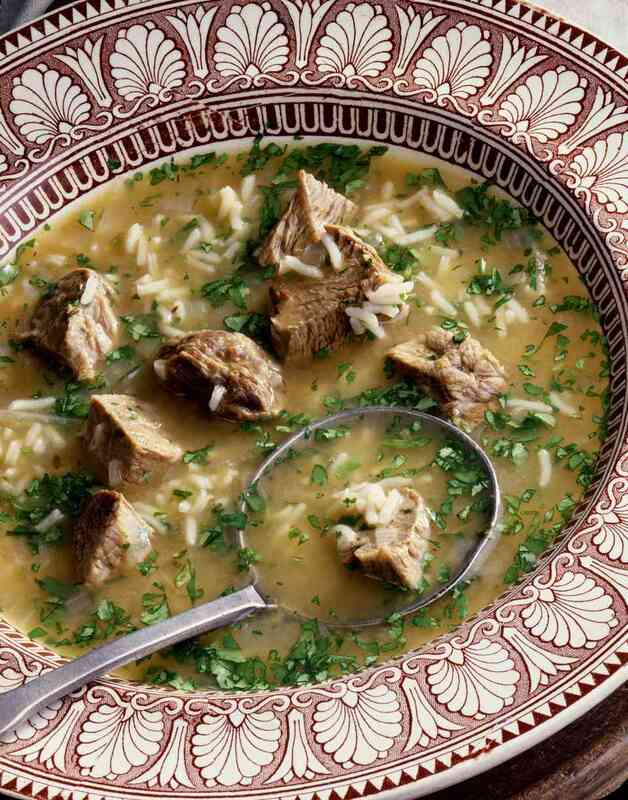 This Serbian Lamb Vegetable Soup (Chorba od Janjetina) is based on meaty lamb bones, and then the recipe varies from household to household. It can include a trinity of green peppers, onions, and tomatoes and then be enriched with egg yolks and sour cream. Other variations include rice without tomatoes and the broth is left ​uncreamed. After platters of cevapcici sausages and peppers are passed, lamb soup is often the first course of a splendid Serbian Easter feast, with lamb in a starring role, either roasted or spit-roasted. The soup can also be made with meaty bones leftover from a roast lamb dinner or spit-roasted lamb, although the flavor will be somewhat different. This recipe calls for 2 whole egg yolks. Just freeze the leftover egg whites and use them in other recipes. Wash 2 pounds cut-up lamb shank, shoulder, or neck meat and place in a pot with 4 quarts of water and 2 bay leaves. Bring to a boil, skimming off foam. Reduce heat to simmer. Add 1 large chopped parsley root, 3 medium peeled and chopped carrots, 2 ribs chopped celery, 1 clove finely chopped garlic, and 2 medium peeled, seeded, and chopped tomatoes. Return to a boil, reduce heat and continue to simmer 2 hours or until meat is tender. Prepare a (roux) by heating 1/4 cup vegetable or canola oil in a medium saucepan. Add 3 medium chopped onions and 1 medium chopped green pepper, and saute until tender. Add 2 tablespoons all-purpose flour gradually, stirring constantly until light brown. Season with salt, pepper, and paprika to taste. Temper the zafrig by adding a little hot soup to it and stirring constantly until smooth. Pour the zafrig back into the soup pot, mixing thoroughly and simmering until dissolved about 15 minutes. Turn heat off and remove soup from the burner. Beat 2 large egg yolks until thick and lemony in color. Add 8 ounces of sour cream and mix thoroughly. Temper the egg yolks with a little hot soup, stirring constantly until smooth. Pour the tempered egg yolks into the soup, stirring until the soup has thickened slightly. Remove bay leaves and serve in heated bowls.